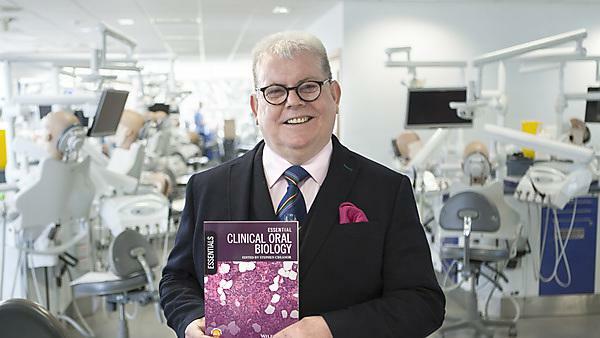 A dentistry textbook authored by a dental academic from Plymouth University Peninsula Schools of Medicine and Dentistry (PUPSMD) and featuring chapters from his colleagues, is set to become the next ‘must-have’ textbook for dental students around the world. “Essential Clinical Oral Biology” is the creation of Professor Stephen Creanor, who has recently retired from PUPSMD. The title is one of the first to be published in the Wiley-Blackwell “Essentials” series for dentistry and medicine. The book is billed as an accessible guide to oral biology. It includes the scientific knowledge required for success in general dental practice and it covers key issues such as clinical oral biology. The textbook will help dental students to gain an understanding of oral tissues and their relationship to oral health and disease. Designed with a student-friendly layout and clinical photographs throughout, each chapter has clearly-defined key topics and learning objectives. Covering the essentials, the book comes with a companion website. According to the publishers, the clinical relevance of each topic is emphasised throughout, making it “a must-have resource for students in the early years of dentistry, dental hygiene, dental therapy, clinical dental technology and dental nursing courses.” They claim it is also a useful revision guide for clinical undergraduate and early postgraduate students. Other PUPSMD dental academics who contributed to the book include Dr Kamran Ali. Dr Louise Belfield, Dr Ewen McColl, Dr Vehid Salih, Professor Christopher Tredwin and Dr Svetislav Zaric .